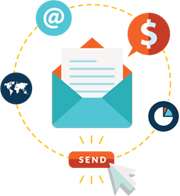 Using purchased email lists are burden on your campaign budget. They downgrade your sender reputation and reduce open rates and conversion. It’s advised to opt for organic email list for better audience engagement and conversion. Achieving maximum deliverability is the end goal of every email marketer. Email marketing infrastructure setup and optimization efforts go in vain if emails don’t hit into the right inbox. Delieverability of a campaign eventually depends upon the authenticity of the email list your campaign used. Authentic data leads to surging open rates, while unverified and ambiguous data in email list could result unexpected surge in bounce rate, unsubscribe requests and IP blacklisting. When you start or expand a business, you aim at getting more buyers. Since email marketing is #1 tactic for reaching out to the people, you might like having this being the top marketing strategy. Why You Should Not Go For Purchased Email List? But here is the check. Your email list is the crucial element of your email campaign as it contains the people who probably are your new customers. But the campaign success depends on how you acquired the list. There are two ways in which email IDs are obtained- one by engaging people with persuasive content and the other- by buying an email list from different sources. Paid email lists are basically the shortcut of getting an audience to shoot off campaign for. Most marketers go with buying email lists despite knowing that it quite often backfires for one or more reasons. Though, buying an email list is the quickest way to earn some odd business, in most of the cases it turns out to be a huge waste of resources. I am listing here some of the reasons why a paid email list is a bad idea to pursue. It likely causes your business more harm than good. An email list that you’ve purchased contains data on the audience who are unknown to you. Thus, every email that barges into their inbox is deemed as junk or spam. People don’t like opening and reading unsolicited marketing messages unless they’ve subscribed to. When annoyance of receiving this junk passes the peak, recipients delete messages or simply mark them spam. The biggest disadvantage with a paid email list is that people are not going to listen to you despite the fact that you may have some outstanding offers for them. You might have a well written email and bunch of irresistible offers packed within the email, but for them you’re just another annoying marketer pushing emails into their inbox. Another downside of the paid email list is that your email service provider may flag red if too many of your messages are tagged spam. Email service providers such as AWeber and MailChimp talks tough on spamming. In case you are found flouting the guidelines stated in their service level agreement, they can close your account, can levy heavy fines, and in a worst case scenario you can face legal trouble too. Moreover, niche email service providers don’t allow using rented / leased / purchased email list in campaigns. They consider it a blatant form of spamming a serious violation of their SLA. Data sellers sell an email list to multiple marketers. Means, many other marketers as well are using the exact same list as you. They bought the list like you, and might be relentlessly flooding recipients’ email boxes with emails. There might be a good chance that these people have already filtered anonymous mails from appearing in their inbox, therefore, your emails will never get into their inbox. This is more than obvious why paid email lists get fewer responses. People don’t bother to open an email that comes from an unknown source and looks like a hard marketing spam. Most of the people on a paid list don’t even open your email. This dents your open rates and CTR calculations. Since the list you’re using isn’t segmented, the people will unlikely engage with the offer given in the email. Why You Should Grow Your Email List Organically? The idea behind above was to tell you that buying an email list is indeed a bad idea. It would be better to build a genuine an authentic email list by putting some efforts. Here are the reasons why an obtain an email marketing list gives your email marketing campaigns a big boost in terms of open rates and CTRs. When a campaign is sent to the people who subscribed to receiving your mail, the chances for the emails to be sent to the valid email addresses are higher. It further brightens the chances that your emails are received in the recipients’ inboxes. This eventually boosts deliverability. Purchased lists contain scrupulous and fake email addresses that people use simply to sign up and receive some free content or giveaways. Purchased lists may have invalid email addresses that can skyrocket email bounce rate. In addition to better Delieverability, organic email list gives better open rates as emails reach to the target recipients. Being more engaged, an organic list gets better response from the recipients. The list contains the people wants to see what you have to offer. Emails sent to such audience opened, read and acted on more. More email open rates translate to more conversion. An organic list contains the emails of your target audience. Thus, after completion of the campaign, you can easily measure true conversion and determine the problems if your campaign fails to take off. Tracking the campaign results help you identify the problems within the campaign and fix them right there. Since people on scraped or purchased list are unknown and not segmented, it’s a hard task to identify why the campaign failed to take off well. How users treat email messages? Whether they are opening or deleting emails? Whether they are moving emails to the junk? Email providers evaluate above actions to calculate the sender reputation and apply algorithms to filter future messages from the sender. They care about their reputation and ensure high deliverability of the email campaign. They don’t even allow you to upload your email list if you don't prove that it is an opt-in list. Don’t let your email campaign doomed. Never use scraped or purchased list to run a campaign as it creates more harm than good.